I want HUDs everywhere, in my glasses walking down the street, in my cycling eye wear and especially in my snowboarding goggles. 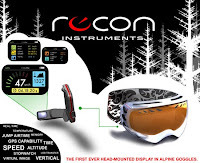 While contact lenses with HUDs are still far off, it looks as though snowboarders will have access to HUDs as soon as next year via the Recon Instrument Goggle. It's not all that promising though. The mock-ups on the site look horrid but as long as the hardware is there, some enterprising interface designer will probably make it work. It's been discussed in the past in various threads on the Sierra forums, wouldn't it be sick if we had radars showing where our buddies are, conditions, congestions and of course mountain maps as a HUD unit that you can attach to your goggles? Then in the future perhaps the goggles could analyze conditions warning of avalanche dangers, or even on an approach tell you how far back you need to be and how much speed you need on take-off. A lot of riders are purists who don't really care for tech on the slopes (other than avalanche beacons and transceivers for the backcountry) but they could easily just ignore it if it was actually available. Sign me up!